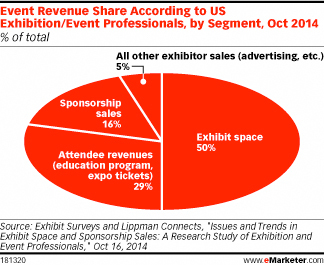 Event professionals have seen growth in both exhibit space and sponsorship sales, according to October 2014 research by Exhibit Surveys and Lippman Connects. Among US exhibition and event professionals polled, 63% said exhibit space sales were up for their most recent event, and nearly half said the same about sponsorship sales. Exhibit space blew sponsorship sales out of the water when it came to revenue share, though, accounting for half of total event revenues. Meanwhile, dollars from sponsorships added up to represent 16% of total revenues, with attendee revenues landing in second. Respondents reported using a variety of incentives in order to grow sales. 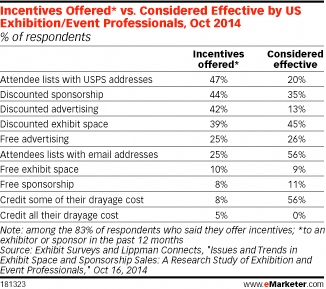 Among the 83% of professionals who said they offered incentives, providing exhibitors and sponsors with a list of attendees’ USPS mailing addresses ranked No. 1 in usage, cited by nearly half of respondents. Discounting sponsorships, advertising and exhibition space were also common incentives, offered by 44%, 42% and 39%, respectively. However, incentive usage and effectiveness don’t always match up. Exhibit Surveys and Lippman Connects found that providing sponsors and exhibitors with a list of attendees’ email addresses—far more useful than physical mailing addresses in today’s digital world—was considered the most effective incentive, cited by 56% but used by just one-quarter of respondents. And while just 8% of professionals said they credited some of their sponsors’ and exhibitors’ drayage costs, the majority of that tiny group found this to be effective. Discounting exhibit space also appeared to pay off, but the same didn’t hold true for discounted advertising, considered effective by just 13%.